Mitt Romey's VP pick may decide the November election. Newsmax rates the top candidates — and includes a few surprises. An exclusive issue: Marco Rubio on what it will take to defeat Obama. 'Rubio: The Right Choice?' 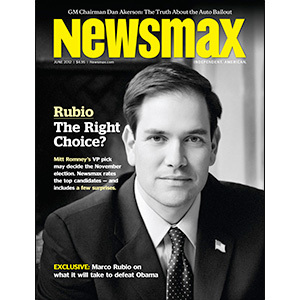 Newsmax Magazine June 2012 Exclusive: Marco Rubio on what it will take to defeat Obama.